V.A.V(Vatsal. Anirudh. Vasudev), the three members of the trio met at The Swarnabhoomi Academy of Music. The trio has been playing together for a while realising they enjoy playing with each other whilst bringing out the best in them. The setlist for the night will contain Brazilian and Jazz Music covering a lot of artists who they've been inspired by in what they play today. Vatsal Bakhda (Keyboard/Piano): Vatsal Bakhda, originally from Kolkata, has spent 10 years learning classical piano, before he moved to Swarnabhoomi Academy of Music where he learned under Pedro Carneiro Silva and Gabriel Geszti, who both hail from Brazil, equipping him with a unique playing style. His time at SAM has enabled him to play various styles of music such as Brazilian, Latin, Jazz, Blues, RnB, Soul, Funk, to name a few. A very versatile pianist, who has just recently moved to Delhi, Vatsal is currently working at Theme Music Institute as Piano Faculty. Anirudh Shekhar (Bassist): Anirudh started playing bass at the age of 16. Studying at SAM has helped him to be versatile in different genres and to know what's right for the music. Vasudev Singh (Drummer): Born and brought up in Lucknow, Vasu continued his early formal training the capital under Sri Umesh Mishra before he moved to drums. His initial fascination with classic rock as a drummer, helped him crossover to develop an appreciation for a number of genres, artists and art forms. Having a keen interest in developing the intricacies of his new instrument, Vasu spent considerable years around the country and in his hometown learning from teachers, with likes of Karina Colis, Alex Tarun Balani, Mr. Benny Soans, Franco Vaz to name few. He got to learn other important aspects regarding in-rehearsal and production at schools like One World College of Music, Global Music Institute and Swarnabhoomi Academy of Music. Since the early days, Vasu has been working as a solo performer and as a collaborator. 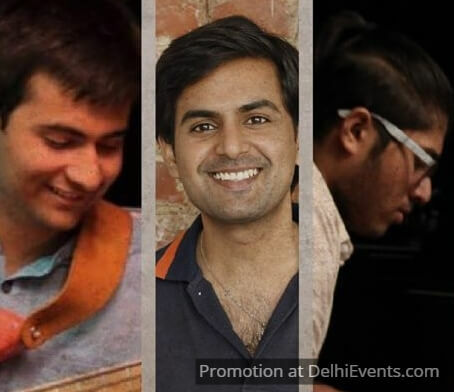 Some of his recent collaborations in the Delhi circuit have been the likes of Figo Maneiro, Ilina Gandhi Eshaan and Priyana, Big Bang Blues and Vaa Zaga. As an open minded and highly appreciative individual, he has been able to meld his worldview objectivity practical output and aims to provide an exhilarating experience for the listener.